Crimeculture: Your stories all evoke an amazing sense of place – it’s one of my favourite things about them! I notice from your biography that you lived in France, Gabon and South Africa as a young child. How have the different locations of your life informed your writing? KR: Thanks, Kate! Being on the receiving end of it, I can’t really say for sure. My father was a diplomat, so travel and living in other places was either something actively happening, or something that was frequently talked about. You might notice that the vast majority of my stories could be set pretty much anywhere. They’re geographically unidentifiable. That’s the only solid effect I can name that my global hop-scotching may have had… my reluctance to put anybody’s feet down in a labeled space, because I seldom see it as critical information. Life keeps going on anywhere, anyway. I guess any other influences are likely to be more subconscious? When you live it, you don’t really ‘see’ it. Crimeculture: This is such a beautifully written and crafted story collection — I loved the idea behind it, of seven deadly sins. Did you begin writing the collection with the ultimate shape of it in mind or did the overarching structure come later? KR: I think there’s something maybe a bit psychic about writing? Consciously you don’t always know for sure where you’re going with a project or specific story, and yet somehow down the line it all just weaves together into a cohesive net. It’s almost supernatural. I’m sure you know what I’m talking about. The first flicker for this book came after reading Clive Barker’s Books of Blood: a collection of short stories, each isolated yet connected. Pieces that stand alone, but once put together form vital parts of a much larger whole. I gave it a shot (based on a whacky reincarnation theme) then decided there was no way I was smart enough to pull it off. But in the background, I’d been thinking a lot about ‘morality’… what it means, where we place it, how far we push it. I’d written three stories exploring these ideas before I woke up and thought: Hey, isn’t this what we were shooting for a while back? Once I’d realised what I was doing, I put my head down and got lost in it for a while. 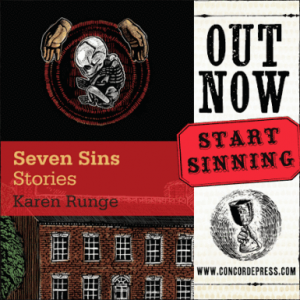 The result was Seven Sins. Crimeculture: I was impressed reading the stories by the wealth of different situations and locations presented as well as the very distinct nature of each main character. Everything felt very real and at the same time intense and “hyperreal”. How did you achieve this? What kinds of research did you do? KR: This doesn’t happen nearly enough, but every once in a while I write a story and by paragraph two I see the details of the setting, scene, character, down to every tiny detail. My writing can be prose-heavy for that reason: if I see it, I feel obligated to describe it. I want to capture it all, which means I have to go back again and again in the edits to make sure that the stuff I’m including actually serves the story. Otherwise, I have to hack it out. The Killing Machine, on the other hand, was inspired by an extremely disturbing vivid dream I had. That final scene? I dreamed that like I was standing right there, experiencing everything blow by blow, five-sensed, right down to sounds and smells. I woke up wanting to claw out of my own skin, knowing the only way to purge those images was to write them. So I guess that worked out! As far as research goes, The Orphanage was hands-down the most demanding. I studied up on labour and childbirth and related complications, which took a lot of hours for the amount of stage-time those details wound up actually having. A few years working on government funding projects in London informed the rest. As far as the other stories go, I just allowed each to unfold, and did fact checks where necessary a little later. I’m glad to hear they came across clearly to you; it doesn’t always work out that way! Crimeculture: Some of the characters in SEVEN SINS are sympathetic (‘Lake Seasons’, ‘The Philosopher’), some are unreliable narrators (‘My Son, My Son’) and some are downright bad (‘Faces’). Do you feel drawn to morally complicated characters? How do you get inside their heads? KR: I try to see things empathetically, so that definitely helps when I’m fleshing out a character, both in their personality and in their actions. As for the morally complicated… well, they’re the most fun to write, aren’t they? As well as being excellent vehicles to help you figure out your own thoughts on shifty subjects, and the grey-area murk they cover. The only ‘good’ character in any of the stories would probably be the male protagonist in Lake Seasons… and look where that got him. But I also feel pretty sorry for the protagonist in Faces. It’s his own weakness, his own fear and inability to accept his desires as natural or even beautiful that make him what he is. So there it is again: empathy. I don’t swallow the view that anything, and I really do mean anything, is particularly cut and dried. In these stories, I just picked a character and put a loudspeaker on their innermost thoughts. I caught some interesting echoes, I think. Crimeculture: Some of the stories in the book are not only terrifying, but feel to me like fierce socio-political commentary, especially the opening story in the collection, ‘Sweet Old Men’. Am I right in reading that theme in your collection? KR: I think maybe when we talk about morality, or when we analyse crimes, the socio-political background is already in there, to varying degrees. It’s part of the machinery that rolls motives into action, just as much as person-to-person experiences and interactions do. Sweet Old Men is maybe more blatant there, because it covers racism, and is one of the very few stories I’ve ever written where you can needle out South Africa as its host country. But it also covers shades of sexism and misogyny, which are universal. So. Where does that leave us? I’d say it probably breaks down to how a person is influenced by their background, how their personality responds to that influence, and how they’re affected by their experiences. And that, of course, ultimately becomes a very personal set of unique factors. You could definitely say that the theme relates to socio-political factors, but it does so about as much as it also relates to the journey of the individual. Or, in these specific seven stories, their downfall and ultimate doom. Karen Runge was born in Paris, France, in October 1983. The daughter of a diplomat, her family lived in France and then Gabon before returning to their native South Africa when she was a young child. 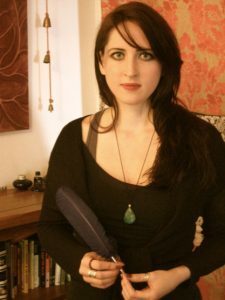 She is a short story horror writer, sometimes an artist, and works teaching adults English as a second language. Between all the short stories, she is currently working on two separate novels.